33 mm 18K white gold case, sapphire-crystal back, bezel set with 48 baguette diamonds (~1.21 ct), guilloched night blue dial with powdered gold hour markers, caliber 215 manually wound movement, approximately 44 hours of power reserve, midnight blue brushed satin strap, prong buckle set with 6 baguette diamonds (~0.19 ct). 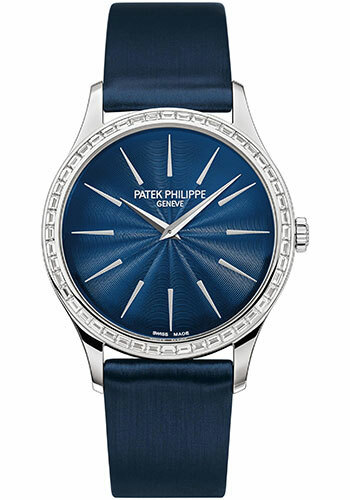 Water resistant to 30 m.
33mm 18K white gold case set with 72 diamonds (~0.47 ct.), sapphire crystal back, night blue guilloched dial with powdered gold hour markers, manual winding caliber 215 movement, approximately 44 hours of power reserve, night blue brushed satin strap. Water resistant to 30 meters. 33 mm 18K white gold case, 6.6 mm thick, sapphire-crystal back, bezel set with 72 diamonds (~0.47 ct), guilloched silvery gray dial with powdered gold hour markers, caliber 215 manually wound movement, approximately 44 hours of power reserve, silvery gray brushed satin strap, prong buckle. Water resistant to 30 m.
33mm 18K rose gold case set with 72 diamonds (~0.47 ct.), sapphire crystal back, chocolate brown guilloched dial dial with powdered gold hour markers, manual winding caliber 215 movement, approximately 44 hours of power reserve, chocolate brown satin strap. Water resistant to 30 meters. 33 mm 18K white gold case, sapphire-crystal back, bezel set with 44 diamonds (~ 0.47ct), white lacquered dial with gold applied hobnail-patterned hour markers, caliber 215 PS manually wound movement, approximately 39-44 hours of power reserve, matte pearly white alligator strap with square scales, prong buckle. Water resistant to 30 m.
33 mm 18K rose gold case, sapphire-crystal back, bezel set with 44 diamonds (~ 0.47ct), white lacquered dial with gold applied hobnail-patterned hour markers, caliber 215 PS manually wound movement, approximately 39-44 hours of power reserve, matte pearly white alligator strap with square scales, prong buckle. Water resistant to 30 m.